Las Vegas McCarran International Airport is the main gateway to the city resort of Las Vegas and its repertoire of glittering casinos, bars and hotels. Our Las Vegas McCarran International Airport guide includes vital contact information, as well as details regarding terminal facilities, public transportation and nearby hotels. Information booths providing general information and assistance are located throughout the airport. White courtesy telephones are available for after-hours assistance. Volunteers also provide a helpful information service in the baggage reclaim area of Terminal 1. The airport is located off Interstate 15 (providing access from the north and south). From the Las Vegas Strip, turn south onto Paradise Road, then follow the signs to the airport. The total drive time from the Las Vegas strip to the airport is approximately 10 minutes. A free shuttle bus service runs between the terminals every 12-15 minutes. Terminal 2 is now closed, with Terminal 1 and 3 currently the only two in operation. Bus: RTC and RTC Paratransit Services (tel:+1 702 228 4800; www.rtcsnv.com) provide bus services to/from most areas in Clark County. Routes 108 and 109 serve the airport (Terminal 1 only) and run to central Las Vegas (35 minutes away) and the Las Vegas Strip (15 minutes away). RTC's Westcliff Airport Express (WAX) services both terminals 1 and 3 and downtown Las Vegas. A range of passes are available - customers are encouraged to download the rideRTC transit app to plan the trip and buy bus passes. Shuttle: A number of shuttle services serve the airport and drop-off passengers directly at many hotels on the Las Vegas Strip. Taxi: Taxis and limousines are available, departing from outside the baggage claim areas. A short taxi ride to the Las Vegas Strip takes 10 minutes, while a journey to central Las Vegas takes 25 minutes. Shops and slot machines are available in all terminals. These include specialist shops such as a gaming souvenir shop and Harley-Davidson merchandise store in Terminal 1. Duty-free shops can be found in Terminal 3. A lost property office is located in Terminal 1 (tel: +1 702 261 5134). Other facilities at Las Vegas McCarran International Airport include a first-aid clinic, medical and fitness centres, a children's play area, massage rooms, smoking areas and an aviation museum. In keeping with Las Vegas’ standing as one of the gambling capitals of the world, there are more than 1,300 slot machines situated throughout the airport. There are VIP lounges in both terminals: these are available to all passengers for a fee, as well as designated airline club members. Ample business and conference facilities abound within the many hotels on the nearby Las Vegas Strip. Translation services are available from the information desk. Free Wi-Fi internet access is available throughout Las Vegas McCarran International Airport, as are pay phones. There is a post office in Terminal 1 and a post box in Terminal 3. TDD phones for hearing-impaired travellers are provided in both terminals. A TDD information line is also available (tel: +1 702 261 3111). Courtesy wheelchairs can be provided (tel: +1 702 261 7874) – passengers should allow 15 minutes for their wheelchair to arrive. The airport is fully accessible, with disabled toilets in both terminals. 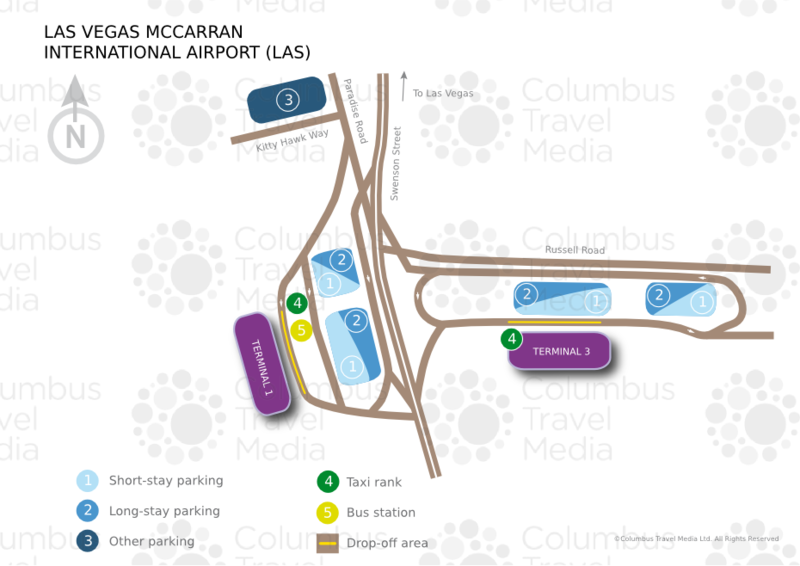 There are several parking options at the airport, including covered short-stay and long-stay parking at the multistorey car park opposite Terminal 1, and further short- and long-stay lots at the car park opposite Terminal 3. Remote parking facilities, served by free shuttle buses, are also available during peak hours. An economy car park is linked to Terminal 1 by a regular free courtesy shuttle. Valet parking is also available, as is a 'cell phone' waiting area for drivers meeting arrivals. For further information, contact the Parking Office (tel: +1 702 261 5122). Car hire companies represented at the airport include Advantage, Alamo/National, Avis, Budget, Dollar, Enterprise, Hertz, Payless and Thrifty, as well as a number of local operators. Desks are located in the baggage reclaim area and shuttle buses take passengers to the Rent-a-Car Center (tel: +1 702 261 6001). Off-site car hire companies can be contacted by using free telephones in baggage reclaim.